Living overseas for several years has kept me from thinking on how to renew NBI Clearance in the Philippines. I knew how to get the clearance if I’ll need it again. But the process changed and confused OFWs, including myself. Recently, my sibling helped a friend in Canada to get an NBI clearance in the Philippines. I’m grateful for my sibling for spending precious time to help me and others. So to pay it forward to Filipinos back home, like my sibling, I decided to write about NBI Clearance application. Effective December 27, 2016. The NBI Clearance Processing will strictly implement the “NO APPOINTMENT NO ENTRY” POLICY for NBI clearance applicants. No appointment will be available on the same day of application. You’ll know about the details of the policy later. This post is for OFWs working abroad including Canada. I divided the steps based on location to make the process easy to follow. 1.1. Get an NBI Fingerprint Card Form No. 5 in the Philippines OR in Philippine Embassy or Consulate. You can ask an authorized representative to get an NBI card form at the the NBI in UN, Ermita. The form can then be mailed to you overseas or you can ask a balikbayan to bring it for you. Once you receive the form, you can go to a fingerprinting service in your area for the rolled impression of fingerprint. If you choose to get an NBI Fingerprint Card Form in a Philippine Embassy or Consulate, you’ll pay for the fingerprinting service. The fee is C$33.75 in Canada. 1.2. Attach a 2×2 photograph with white background (taken within three months prior to application). 1.3. Send the accomplished form with photograph and authorization letter to your representative in the Philippines. You’ve seen the reminder earlier about the “NO APPOINTMENT NO ENTRY” POLICY for NBI clearance applicants. The policy will require more work for your authorized representative; with your help, the NBI Clearance online application wouldn’t take much time. 2.1. 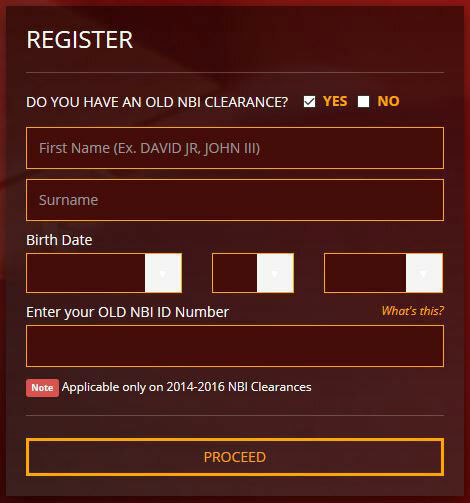 Register for an NBI Clearance online appointment. YOU or your authorized representative can make an appointment. But I think, the OFW should schedule the appointment because an email is required to complete the process. Note: If you have an old NBI Clearance taken between the year 2014-2016, you have to enter the OLD NBI ID NUMBER. Otherwise, you have to register as new account. 2.2. Choose the schedule and NBI branch. The ONLY branch that accepts authorized applicants is at NBI Clearance Center in United Nations Ave., Ermita. After making an appointment, print the documents for the application at the center. 2.3. Pay the fee (Php140.00) in the bayad center using the Reference Number. The fee includes the courier service if you prefer to have the NBI Clearance deliver to an address. 2.4. Submit the NBI Clearance application at the center on time. The authorized representative should bring his ID and authorization letter. 2.5. Keep the receipt or any documents for record keeping and reference. The process of getting an NBI Clearance in the Philippines depends on how efficient is the communication between the authorized representative and the YOU. The trick is for the OFW to complete the NBI Clearance requirements ahead of time. Allow at least one month for the entire process to be completed because setbacks can happen or not. It’s best to stay on the safe side, relax, and not panicking. Wherever you are living abroad, the process of getting or renewing the NBI Clearance is the same for the most part. TIME is the one thing that is spent differently. So will you get the requirements as early as possible or will you wait till the last minute and stress yourself and the people involve in the process. I say DO it early. I know you’re with me. Right? This just doesn’t apply to NBI Clearance; it goes with all documents most importantly is the Philippine passport. I’ll update this post with every tips I can glean from my family and possibly from you. Where are you from applying for NBI Clearance? How did the new policy affects your application? Hi po, magtatanong lang po sana ako about sa nbi clearance. Nasa abroad po kami now and naipadala ko na sa relatives ko sa pinas kaso po may nakita ako na kailangan daw po ng special power of attorney. Ano po ba yun? And kapag magseset po ng appointment yung pangalan po ba ng representative ang ilalagay o pangalan po ng kukuhanan niya ng NBI? Tinanong ko yung kapatid ko about it kasi siya ang kumuha ng NBI ng relatives namin overseas. Ang pangngalan ng kukuhanan ng NBI ang ilalagay sa appointment. Dadalhin ng representative yung authorization letter sa appointment date. Hello. Just want to seek information about securing NBI Clearance. OFW po ako at hindi po ako makauwi ng Pinas agad agad to secure NBI Clearance. Gets ko na din po yung process nang pag kuha ng clearance kaso po problema ko wala po ako as in mautusan na mag process nung nbi ko sa NBI MAIN sa probinsya po ako at yung magulang ko po ay matatanda na. Any private services po nag aassist for securing NBI Clearance na kahit bayaran na lang po. Thank you. Sana nga pwede na lang online lahat Janica pero hindi pa pwede. I think pwede mong ipadala through mail directly sa NBI. Pwede kang magtanong sa Philippine Embassy or Consulate kung saang bansa ka since kailangan mo din ng form and fingerprinting. And disadvantage lang ay matatagalan through mail. Can you give us an update how it goes Janica? Hi po. I do not know who else to ask when I chanced upon your website. I am an OFW here in the Caribbean and I am planning to apply for an NBI clearance in New York. Kahit po ba sa probinsya pwede po ba ipadala ang authenticated forms for nbi clearance? Wala po akong masyadong kaanak sa Manila so I was wondering if one of my relatives could do it for me in our hometown instead of the person going all the way Manila. Thank you…Looking forward to your response. I don’t think that’s possible Che. Try asking favor to friends or any acquaintance; enclose your authorization letter to be sure. Hi thanks for sharing it’s really a great help! I have a question I’m done my fingerprints in one of the agency office here in Toronto but when I emailed Philippine consulate Toronto they said after my fingerprinting I have to go to their office for notarization of my NBI form 5. But the person in the agency who help me for the fingerprints told me that I just need to send this form to my representative in in the Philippines. So I am confused please help me which one is correct information? Hi Marie. Like you I am also confused by conflicting procedures here in Canada and in the Philippines. If I were you, I would ask my representative in the Philippines to inquire at the NBI whether an applicant should have a notarized NBI form 5. It would be great if it isn’t required. Or better yet ask on the Facebook Page of NBI because maybe, just maybe, you’ll get a faster response. Hope that helps. And let us know about the outcome. Hi Ask ko lang po. Napadala ko na lahat ng docs and authorization letter through LBC. Nakapag set na rin ako ng appoint sa NBI UN. Pag na process na ng ate ko since siya ang authorize na person ko, makukuha ba agad ang NBI Clearance on that day? Jerald expect that your sister will pick it up at a later date. Pero pwede din niyang pakiusapan baka malay mo makuha din sa araw na iyon kagaya na lang ng nangyari sa kapatid. Good luck! Hi just wanna ask I’m here in Hong Kong po and want to get NBI Clearance through Philippine Consulate dito sa Hong Kong, but nung nandun na ako ask ng staff if for what bakit ako kukuha ng NBI Clearance. I answered for application sa Canada as caregiver but she’s asking my LMIA copy which is still on process. Sabi balik ako pag meron n un. My question is anung pwedeng ibang dahilan ko kung bakit ako kukuha ng NBI Clearance para mabigyan nila ako. Sending the documents to Philippines to process and bring back here will take a lot of time that’s why I want to get now to save time. Thank you po sa sagot in advance. Hi Melissa. I’m not sure if there’s a way to get around the policy of the Consulate of issuing NBI Clearance to caregiver applicants with LMIA. It seems reasonable on there part and to yours for using time wisely. The recent changes in the caregiver program would partly explain the strictness of the Consulate. The 2 pathways (caring for children and people with high medical needs) for caregiver started in November 2014 and will end in November 29, 2019. Before the programs expire, caregiver should be able to apply for permanent residence. To qualify for permanent residency, caregiver applicants should complete 24 months of employment and should apply before November 29, 2019. It is still unclear of what will happen to the 5-year pathway for caregivers after the deadline. Hope that helps and may you get positive feedback for both applications. Hello po. Itatanong ko lang po how long will it taka ung processing time. They got my application ( based on my courier) last March 12 at ngayon po wala pa rin po akong balita even though I’ve sent them the documents kasama ang self-enclosed envelope. Is there a way to follow up po regarding the application? Hi guys! Gusto ko lang po magtanong. Mag renew po sana ako ng NBI ko sa Pinas nandito ako ngayon sa Dubai. May form napo ako ng SPA & bio paper ba yun? May pipirmahan po ba ang Philippine Consulate sa SPA bago ko ipadala sa Pinas gamit ang courier na DHL o wala na? Tsaka ako po ba ang mag set ng appointment o yung kuya ko nalng na nasa Pinas? Hi! Is NBI taft different from NBI U.N.? I’m the authorized relative, nakapagset na yung applicant ng appointment before I read your post. Ang sabi po niya NBI Taft ang niset niya. Kung magkaiba po, pwede pa ba magset ng bagong appointment? Thank you po. Hi Aliza. It’s the same thing. the NBI is near UN Avenue and Taft Avenue in Manila. Ask ko lang po kung mag paparenew po ng Nbi clearance tapos nasa ibang bansa po yung may ari ako po magaasikaso. Meron na po lahat ng documents. Saan po ba sa NBI Main Office pupunta? Tama po ba na sa Mailed Clearance? Kailangan ko pa po kasi ipa-authenticate sa dfa and embassy yun eh kaso lang sa March 28 ko pa daw makukuha ganon po ba talaga katagal? Yung kakilala ko po kase is nakuha niya agad. And sabi niya hindi daw po sa mailed clearance pipila don. Hi Giorgia. To answer your question, I have to ask my sibling in the Philippines. She confirmed that you can get the NBI Clearance to the Mailed Clearance Section and you can ask (as in makiusap) for the clearance to be released immediately. If the instruction have changed, I appreciate if you could give us an update on how you are able to get things done. Thanks! Do we have options on the validity of NBI Clearance? I always remember getting it with only 6 months of validity. Do we have like a year? That would be a good option but not possible at the moment. Nor in the future. I’ll bet on that one. Hi good day po, paano po yung sa akin NBI personal copy po ang dala ko dito sa Dubai. Nagpunta po ako sa Consulate para itanong kung pwede na yung NBI ko na personal copy, sbi po nila pwede at ginawan na nila ako ng SPA tapos po pinadala ko na sa Pinas. Pag dating po sa Pinas sa DFA ayaw po tanggapin kailangan daw po yung hinde personal copy. Panu po gagawin ko. Pasensiya na po dumodoble po kasi yung gastos po. Salamat ng madami. Godbless. Sana po ay mahelp niyo po ako. How about try in a different NBI offices. Did you try making an appointment online? You may or may not need the old personal copy of NBI Clearance. You can also try asking on the Facebook page of NBI before any further action to avoid wasting money and time. Hope that helps. Hello po, sa case ko po meron na akong complete form from the Philippine Consulate. Ang 2 options na sinasabi nila e send nga sa Pinas derecho sa NBI Main and enclose daw ng 200 pesos. Pwede pa din ba yun? Paano kaya nila masend back hindi naman sinabi kung paano. Second option po e relative na pag asikasuhin, but meron na pong appointment ngayon.Paaano po magandang gawin, ako magpa appointment under my name and kapatid ko ang pupunta? Tama po ba. Salamat po. The best option is no. 2. Ikaw na gumawa ng appointment pero tanungin mo din ang availability ng kapatid mo para walang conflict sa schedule. Pwede niyang ipa DHL yung bagong NBI Clearance sa iyo. What if I dont have any authorized person or relatives to take care of my NBI on my behalf back in the Philippines because almost all of them are abroad and I don’t have much of a friend to ask so are there any options that i can choose that doesn’t involve having a authorized person in the Philippines or like just someone working in the consulate to process it and I just have to pay and they will take care of everything? The next best thing is to inquire in the Philippine Embassy or Consulate on how to get an NBI Clearance through their office. The advantage of doing it in the Philippines is that you can save more and get the NBI Clearance faster. Hi, pwede kaya same day process through my authorized person? (Gawa na ang online application with appointment set, and paid) Makukuha kaya the same day kasi ang layo ng probinsiya na panggagalingan? I don’t think so. There’s a pick up date for the NBI Clearance. Para sa NBI Clearance Renewal, pwede po bang gamitin yung “NBI Clearance Quick Renewal” dun sa NBI website. Ipapa-deliver sa kamag-anak sa Pilipinas, tapos tsaka na lang i-arrange personally yung delivery abroad to the OFW. May nakagawa na po ba nito na successful? Hi Matthew. It says that it’s “Applicable only on 2014-2016 NBI Clearances.” I didn’t quite get the scenario. But why not make an online appointment and authorized a relative to do the transaction on your behalf. That is much easier and the common way of getting an NBI Clearance for OFWs. Let me know how it work for you. Hello po, I just want to ask ko if ok lang na ipadala ko yung previous NBI clearance co together with my photos and photocopies of my passport and visa? Thank you! Kasi po wala po talaga akong time na pumunta sa Embassy. Ipapadala ko lang sana sa kasamahan ko yung old nbi clearance. OK lang po ba yun? Thanks a lot! You could do that Mayang. But if you are referring to the Philippine Embassy overseas, I think you have to personally come. If you don’t have the time, then ask help for someone in the Philippines to do it for you. Hi po, ang NBI ko 2007 pa gusto kung mag renew ibig sabihin kaylangan kung mag registered ng bago at kalimutan na ang lumang NBI ko ganun po ba? Yung NBI ID number ko di ba na nila kaylangan yun? Mag sisimula ako sa simula as a new applicant? If it’s expired then you need a new NBI Clearance if you need it. I’m not sure if you’ll have the same number. Ang importante malinis ang rekord. Thank you for sharing this information. I have a situation, the NBI clearance that I have is still valid until September 2018. However, the company that I am applying at wants me to get a new one since the gap between the releasing of my NBI and the day that we landed here in Canada is over a month ( NBI release date: Sept. 12, 2017, date of arrival in CA: Oct 26, 2017 ). I am in New Brunswick and the nearest Phil Consulate where I can go to get the NBI form 5 is at Prince Edward, we don’t have a drivers license yet and my partner is working and I have a part time job plus an 8 months old baby so it’s hard for us to travel. 1. Can we send an e-mail to Phil Consulate and request for the NBI form 5 to be mailed to us? Or can they send us a scanned copy? 2. Are scanned copy of the form acceptable? including the 2×2 pic? 3. In my case, where the NBI is still valid, is it possible to ask the nbi in the Phil to send me a scanned copy of my nbi but the release date will be the day when they scanned it? Hi Cristy. Your situation is a something I haven’t heard of. To be honest, the best way to get a first-hand information is if you can call the Philippine Consulate in Prince Edward Island, which you’ve mentioned that is closest to your place. To answer your question, I am not sure if the Philippine Consulate will allow the scanned copy of the form but it is possible to request an NBI form to be mailed at your address. Here’s another solution I can think of by asking my relatives in the Philippines. You can asked them to get a copy in the Philippines becasue the NBI form is no longer needed since the record (including biometric) is on file, I suppose. They can follow the instruction in the post. But to be on the safe side, have them inquire if it’s possible to get another copy of the still valid NBI Clearance before making an online appointment and go through the process. I hope, my thoughts made sense. And good luck with the job and everything in New Brunswick.